Suitable for vegetarians. 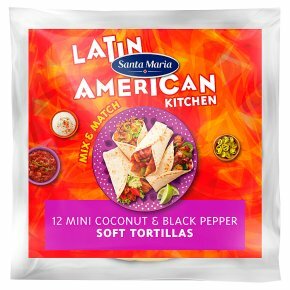 Mini Coconut & Black Pepper Soft Tortillas These irresistable little tortillas are deliciously flavoured with coconut, lime and black pepper - all typical Caribbean ingredients. The slightly sweet flavour of coconut and the tanginess of the lime make it perfect to fill with flavour-intense or spicy food. Wrap the tortillas in foil and place in a preheated oven at 180°C/350°F/Gas Mark 4, for 10 minutes. Place on a hot, dry frying pan or under the grill for 6 seconds each side. To warm - remove from the pack and either:Tip Hold a single tortilla with a pair of tongs over the gas flame on your hob for a couple of seconds on each side.Warning Use the tongs so you don't burn your fingers!Do not leave the tortilla unattended over a naked flame. Microwave at full power (650W) each tortilla for 8 seconds or all together for 45 seconds.